What Apple showed us today was nothing less than the future of education. The future we'd all been imagining for decades, no less. Harry Potter stuff. It's going to change the way we learn, the way we think, the way we live. But let's remember that right now, today? It's entirely out of reach for all but a few of us. Let's start with the good. There's a lot of it. Fifteen bucks for an interactive textbook is an amazing price; they'd normally cost a hundred new, about half that gently used. The features that Apple's introducing—particularly those instant flash cards that might have gotten me through Chemistry unscathed—are indisputably an improvement over stale highlighters and multi-colored Post-Its. All of this represents the best kind of progress, a paradigm shift in education. That is, if you can afford it. 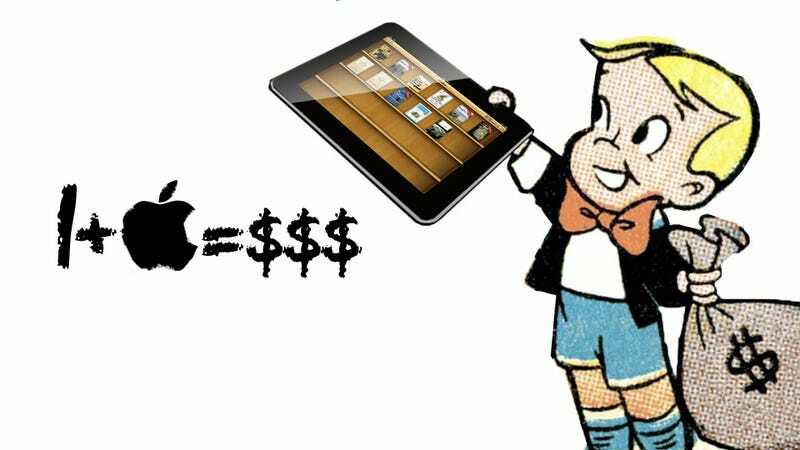 I've argued before that iPads are cheap for what they are. And that's true, assuming that what they are is a secondary device on which people with healthy disposable income can watch their YouTubes and send some emails and play Sword and Sworcery for hours and hours. But while iBooks are very affordable textbooks, the iPad makes for one insanely expensive backpack. Under the best case scenario, you're a teenager in a district that has bought iPads for every single student. It's free for you, which is great! But even with a healthy discount, all those tablets carve a multi-million dollar, taxpayer-funded chunk out of the education budget. Money that could be going to dozens of other in-classroom aids, teacher salaries, healthy lunches, etc. They'll come from somewhere, at the expense of something else. Which would be fine if that iPad were a standalone device that could accommodate four years of curricula. It's not. Not even close. Standalone? Try writing a 20-page term paper on an iPad. Or better yet, try telling every student they need to buy a $70 wireless keyboard. Oh, and it's going to be spending a lot of time in your backpack, so better tack on a $40 Smart Cover. The reality is that no matter how far Apple has pushed into the cloud, iPads still need laptops to complement them. And those accessories, those laptops? Whether it's the student or the schools, someone's paying for them. Which might even be worth it if the iPad could disappear textbooks from your life altogether. But it can't, not remotely. While Apple's got three major textbook partners lined up, at the moment the selection is treacherously limited. Which means that for now, and potentially for a long time, backpacks across the country are going to be loaded down with hefty Pre-Calculus and AP Physics tomes no matter how many iPads schools buy. And even the ones that exist have their pitfalls. You can argue that they only cost $15 a pop—money that under Apple's plan can also come from schools, not individual students—and that those savings alone make them worth it. Which would be true, if publishers hated money. But publishers are businesses, and the business model in this place is clear: instead of selling an updated textbook every 5-10 years for $100, update and sell every year for $15. And it'll work; it's not like you can hand down an iBook from year to year. In fact, you expressly can't. And then consider this: these iPad textbooks are every bit as big as their dead tree counterparts, and you need a lot of digital storage to lug them around. The eight books on display in the App Store today average out to about 1.5GB each; a full year's course load would quickly fill up a 16GB iPad, which means either schools/students will have to shell out for the more expensive 32GB version, or students are responsible for their own external storage options. My wallet hurts. What all this adds up to is a education revolution for the landed gentry. Or even worse, schools that can't afford it chasing a wave that's years away from cresting. Millions of dollars spent on a supplementary learning tool. A distant horizon mistaken for the here and now.